WESTMERE, N.Y. (CNS) — Linda Brown approached the candle stand at her parish, Christ the King in Westmere. She dropped a donation in the collection box and lit two candles. Her husband, Ed, stood beside her as she bowed her head and said a silent prayer. He explained that the two candles were for his wife’s mother, who recently passed away, and their son Jason, whom they also lost. 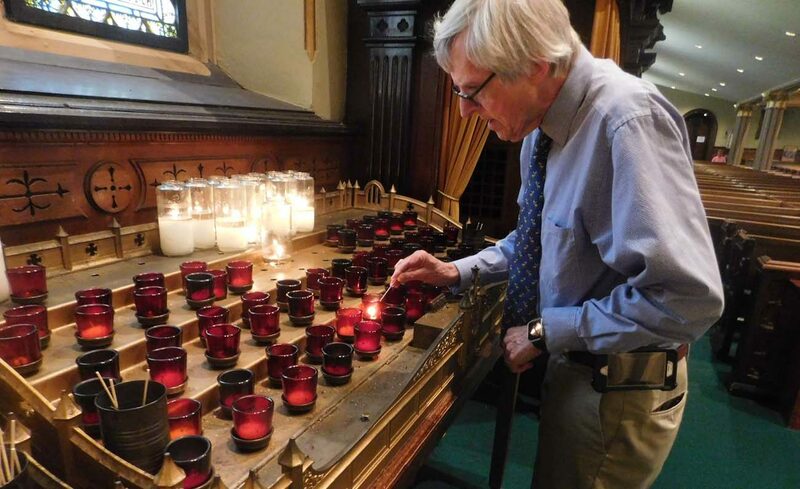 Ed Brown told The Evangelist, newspaper of the Diocese of Albany, New York, that being able to light a candle says “we still remember” loved ones who have passed from this life to the next. Linda Brown agreed that the candle stand, a new feature at Christ the King that had been requested by parishioners, has been helpful to her. “I think it’s comforting,” she explained. The act of lighting candles is a quiet but ever-present tradition in the Catholic Church and beyond. Candles appear at makeshift memorials after a tragedy and at official memorials when Catholics gather to pray. Candles are used at every Mass; at the Easter Vigil each year, a special candle is lit from a new fire and its light passed to individual candles held by parishioners. Candle stands are often tucked away in the corners of churches, but they make an important impact on the faith of many parishioners. Father James Fitzmaurice, pastor at Christ the King, said parishioners had asked about getting a candle stand for quite some time. Visitors also partake in the tradition. Cleary recalled that, when her son and his wife visited Christ the King for the first time, her daughter-in-law immediately asked whether there were candles available to light. “What we remember about church is that you can go in and light a candle,” Cleary said. Joe Krivanek visits St. Mary Church on his lunch hour while working in downtown Albany. He lights a candle at the church about once every week. “I just feel that it’s something to do” in memory of family and loved ones, he said. Leo Wang of the Cathedral of the Immaculate Conception in Albany, also was lighting a candle at St. Mary Church on a recent afternoon. He said he does so every time he stops by the church. Lighting a candle, Wang added, “is like signing a guest book” at a parish: though no else will know he lit a particular one, God knows he was there. Benson is a staff writer for The Evangelist, newspaper of the Diocese of Albany.